Set on the shores of Jumeirah, the Jumeirah Beach Hotel Dubai is a 5-star family beach resort, an epitome of luxury and comfort. You can have a refreshing stay with a plethora of fabulous family activities, world-class facilities and excellent dining options. 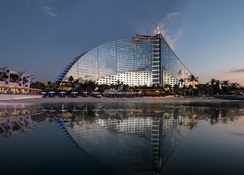 The hotel is one of Dubai’s most iconic hotels with blue tinted glass that reflects the magnificent ocean. It offers a wide range of facilities including water sports, tennis and squash, Sinbad’s Kids Club, unlimited access to Wild Wadi Waterpark, six sparkling swimming pools, a climbing wall and a private beach to lounge on. Each of the hotel room offers wall-sized windows with stunning views of the Arabian Gulf, free Wi-Fi, en-suite bathroom with free luxury toiletries. But that’s not all, with 21 restaurants and bars, a combination of informal and formal dining options, you’ll have everything that you have wished for on your dream beach holidays! 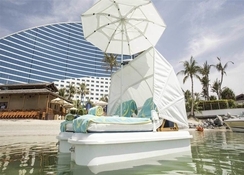 Jumeirah Beach Hotel Dubai is located on a private sandy beach of Jumeirah, which comes with a private marina and a view of the world-famous hotel Burj al Arab. The hotel offers everything that you wish for on your sun-soaked beach holidays; however, if you wish to explore the local souks of Dubai, then Souk Madinat Jumeirah is a 10-minute walk from the hotel. Dubai International Airport is 20km away. The transfer time from Dubai airport to the hotel is about 45 minutes (20km). 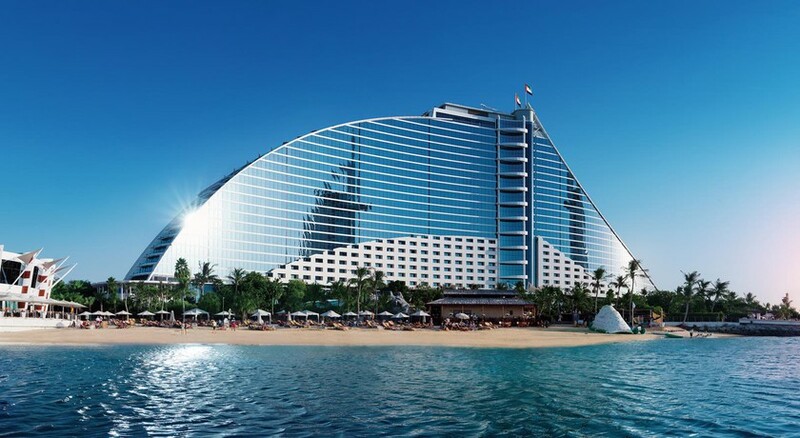 All of the 618 rooms, suites and villas at the Jumeirah Beach Hotel Dubai are luxuriously furnished and provide stunning views of the Arabian Gulf. The rooms have either a king-sized bed or twin beds and offer uninterrupted views of the Burj Al Arab Jumeirah. Its luxurious bathrooms come with a separate walk in shower as well as a bath. All the rooms feature tea and coffee making facilities, safe, hairdryer, minibar and complimentary Wi-Fi. Other superior rooms come with an additional sofa-bed. In addition to these amenities, you also have an interactive LCD TV, iPod docking station and remote-controlled air-conditioning. Few of the Executive class rooms offer complimentary breakfast and access to a private pool area. Get ready to have a memorable gastronomic experience at Jumeirah Beach Hotel Dubai. There are 21 restaurants and bars to pick from, serving a wide range of exotic dishes and international drinks. From exotic beachside locations, to family-friendly hotels, to a fabulous nightclub, you have something for every mood here. The hotel offers an assortment of international cuisines including Indian, Argentinean and Italian. Don’t worry about your kids’ unusual demands when it comes to food. Many of the restaurants here have a kids’ menu. Refreshments are offered at the rooftop Lounge, 3600 bar and the Pool Bar. 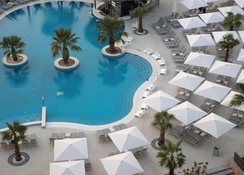 As Dubai’s one of the best family resorts, Jumeirah Beach Hotel Dubai keeps everyone entertained. From indoor games to outdoor sports, there is a plethora of activities to choose from. Kids’ clubs, teenage vibes, parent's pleasures and things to do for the over-60s – everything that you can imagine! Experience leisure facilities that are quite simply, second to none. Plan a dive and discover the underwater world of Dubai, or take a dip in the Jacuzzi pools. Hit the beach and play beach volleyball or football with palm-tree goals. For a little extra, hop on a helicopter for a ride over the gulf. Better still, hire a yacht and just follow the tide. 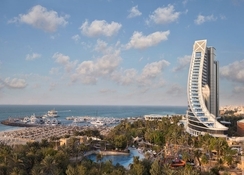 The Jumeirah Beach Hotel Dubai will be fully refurbished in 2018 with modern and fresh look. The refurbishment will take place from May to October 2018. The hotel will stop receiving guests during that period to enable a comprehensive and fast transformation. In continuation of our efforts to expand and enhance our guest experience across our collection of Jumeirah Hotels, we are pleased to advise you that in 2019 we will be embarking on the addition of a new luxury Jumeirah beachfront hotel located to the north of side of Jumeirah Beach Hotel. In preparation for this, from October 2018 we will be converting our existing marina into an extended beach. As a result, our marina will no longer be operational, and we will therefore be unable to accept requests for future yacht moorings. Beach development activities will predominately take place offshore and be isolated to the small area surrounding the existing marina. During this time we will ensure that the area is appropriately screened from view and we expect disruption of guest experience to be minimal. The main beach, overlooking the iconic Burj al Arab Jumeirah, as well as all of our swimming pools will remain operational throughout. Planning for the exciting new property is in the early stages and we look forward to sharing further details regarding our 2019 construction schedule in due course.